I was one of those folks who really liked the old Charadon Granite Foundation color. Not because of the exact color it was, but because of all the uses I found for it. It was dark enough that I could use it for simulating chips of paint on most colors of armour. It was perfect for adding text to scrolls. It's one of those colors that looks like lots of other colors in shadow areas. It's not really grey, it's not really brown and it's not really green. But... you could add a layer or two of brown over it and it made the perfect base color. If you decided to add a couple layers of grey over it, it worked perfectly there too. That's what I miss about it. Now don't get me wrong, I like the new Stormvermin Fur. It's a nice mid tone grey. But it's not a replacement for Charadon Granite. It's not dark enough to do the same jobs. I need something that is a bit darker and similar in it's chameleon like characteristics. I need something that can work well under browns, greys and other muted colors. It just has to show a sliver of itself as a shadow in the recessed area. Nothing more. I just don't want to use black, so someone has to be able to do the job. Enter Thornwood Green from P3. I was paying off my tab at my FLGS before they sent someone to "talk" to me about what I owed and I happened to find this color in the paint rack as I was looking around. In the bottle, it looks super close to the old Charadon Granite. So I scooped one up to see just how close. The far left is P3 Thornwood Green. The middle is the old Chardon Granite and the far right is the new Stormvermin Fur. While the Thornwood Green is a shade lighter than the Granite, it is darker than the Stormvermin Fur. That's the most important thing for me. I think this color will work for me. It's dark enough to do what I want for now. I can add a shade to it to darken it if I need to and maybe the slightly purer color will help me with introducing some color back into the shadow areas of my models and keep me from getting too grim-dark. So until I find something even closer, it's P3 Thornwood Green for me. P3 make a few blacks and greys, some of them might be closer to the Chardon than this green! Good find Ron. I'm using Cryx Base for muted greens and greys now, but I need something else for browns. Vallejo Heavy Charcoal is a good match to Charadon Granite. Thank you very much for this post! I'd been hunting around for a colour to use on my elven cloaks for an upcoming LOTR project and thornwood green is perfect. I'd looked at it in my box of paints and dismissed it, but seeing it painted out compared to a couple of other colours has made me realise how perfect it would be. You'd be better off with Vallejo Model Colour Black-Grey. As Chevalier de la Terre mentioned, Vallejo's Heavy Charcoal may be an adequate replacement. I'd also suggest Vallejo's German Gray #995. I don't like the fact that GW retires hues every so often, that is why I almost exclusively use Vallejo and P3 product. I appreciate the comments folks. As far as a "dark grey" color for the replacement, I'm opting out of that. I've got plenty of dark grey colors. I'm looking for that Chameleon aspect where I can use the color as a shadow for lots of other colors. Grey just does not do it for me. Hobby Horse: They might... but I don't want a grey. I want something with a bit of color. I can push this color in either direction (grey or brown). Although it looks a bit greener on the screen now. Chevalier de la Terre: Does it have the same characteristics or is it a dark grey? That was the beauty of Granite, it was grey, green, brown and lots of other colors all in one. Dan Smith: It's not perfect, but as far as the chameleon aspect, I haven't seen anything else that does the same. A shade of Agrax Earthshade will add some warmth to it and darken it down as well which might bring it even closer to the old Granite color. Justin: Really? I might go look at that one, but I thought I saw it the other night when I was looking through paints and it didn't impress me. If I remember, it had the darkness, but missed the chameleon aspect. I can get dark anywhere... I need that ability to simulate a multitude of other colors. Ron, very similar characteristics, not a dark grey; it was made as a match for the Foundation Charadon Granite (hence Vallejo "Heavy"), much the same way the entire Vallejo Game Colour line was done to match the (now replaced) GW line. Vallejo Model Colour 889 USA Olive Drab is also a very, very similar colour, if a little browner. Both tend towards the brown/charcoal/tinge of green, etc. rather than the grey aspect. Thornwood green is a great colour and I really like P3 paints, but for a close match to Charadon Granite the two colours listed above are IMHO about as close as you can get to the original. Chevalier de la Terre: Then I will have to pick those colors up and see. Fayte: It's one of those colors that snuck up on me. I bought it, didn't give it a second though and then one day it hit me... I use it all over the place. Muskie: I wouldn't sweat it unless you used lots of Charadon before. If it wasn't one of your "go to" colors, you may not even miss it. Hobby store tab? Is your hobby store like a bar? Good stuff. 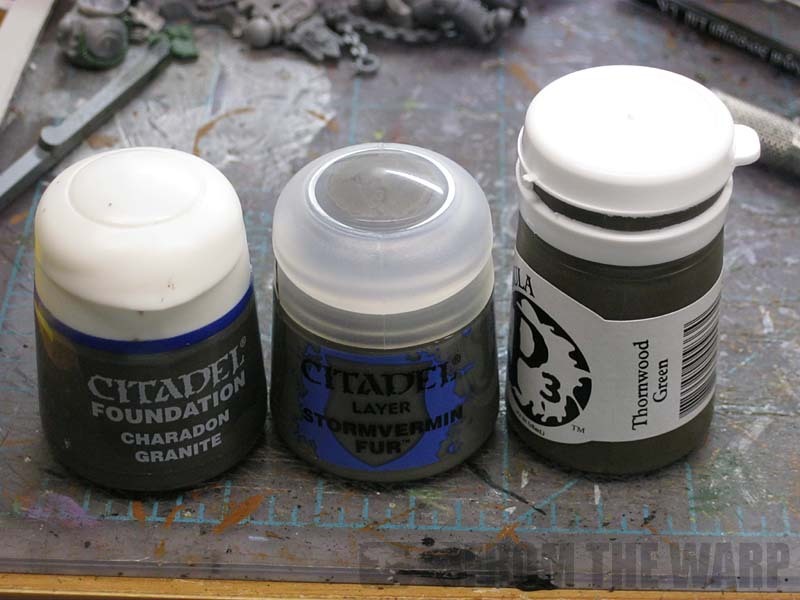 Charadon granite is the cornerstone of the cammo scheme I'm doing on my guard army, the undercoat for my Raptors space marines and the undercoat I used for ork flesh. I still have 4 pots of it, but not looking forward to running out. Nice to know of some close replacements. I don't find Heavy Charcoal to be a match for the Charadon Granite at all, to be honest. It's purely a grey, without any hints of brown or green to it - it's essentially German Uniform Grey but for the fantasy line. Now, the VMC version of Feldgrau should just about hit the nail on the head for you, Ron. Ah, sorry for the double post mate, I just thought to check the Big Box O' Paint. VMC "German Field Grey" is a gray green with a small hint of brown. "Black Green" is a very very dark green with a hint of brown as well, that's from their Flames of War line. 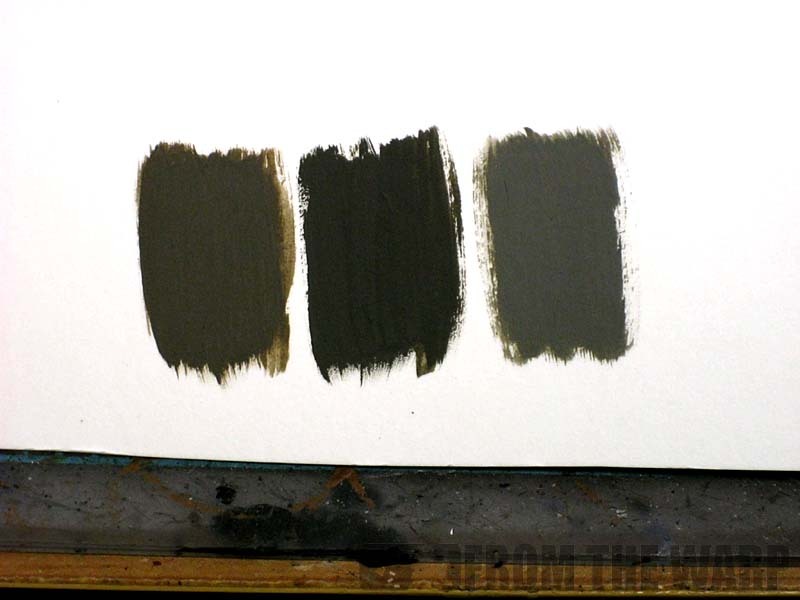 "German Grey" is the one I mislabelled as "German Uniform Grey" above is a plain grey towards the dark end of the spectrum, pretty much identical to VGC "Heavy Charcoal", which I tend to use with a bit of black wash or thinned out black glaze for doing black (when I'm not using P3s Coal Black). Mmmm...I'm wondering after the differing views above if the VGC colour hasn't changed somewhat; I have a quite old bottle and Vallejo colours have been known to change subtly in some instances. You might just have to take a chance Ron, though if you're anything like me you'll need no excuses to buy more paint! What range of things would you be painting that would want want a Charadon Granite foundation, Ron? And whilst you have said it has this grey-green-brown quality to it, why would you paint whatever you were painting with a specific Grey OR Green OR Brown foundation to it instead? Btw, you said something about using but one kind of metallic [either a silver or a gold] and you would change its colour accordingly with washes or inks. This was instead of having a range of metallics [silvers or golds]. You got your variety with what you did to that one paint after laying it down. And I suppose whatever you put it onto as well. Do you recall mentioning that? Drathmere: Yes and no. They sell soda there. Rednekkboss: One day those will run out. Keep this post in ind so heave something to come back and reference. Faolan (Jake): The VMC version of Feldgrau? Is that the name of it? What would be the name of the one color you would suggest? Chevalier de la Terre: I'm looking for a reason to go buy another paint. If it's in the sake of experimenting, I'm in. Marshal Wilhelm: Ise the Charadon for a number of things. 1. Script on scrolls. It's dark enough to do the trick and not too dark as to jump out. 2. Battle damage (paint chipping) on light colored armour. 3. Thinned down to simulate grime spills. 4. Shadow reinforcement on light colored armour. 5. As a base for gold elements that are really dirty and grimy. 2. The base color for my grey stone elements (chest eagle). 3. The base color for my tan stone/bone elements (left shoulder crux). 4. When I do battle damage (paint chipped) on the light colored armour plates. 5. Shadow reinforcement in the light colored armour recessed areas. 6. Any place I want to show a considerable grime build up. More than I would a shade to represent. You can see the list can get long quickly. And I do remember using the washes to modify a single metal color. In fact, since it was mentioned in passing before, I'll do a much more comprehensive post on it now to show you exactly what I mean. It's a cool trick for a variety of effects. @Chev - My Heavy Charcoals are new within the last year, and they justify the "heavy" part as having more pigment than normal, ie Foundation style. Ultimately I cannot suggest one paint only, I think you're going to need to go to keeping 2-3 around that are slightly different and use it depending on the job at hand. That, or buy a few of them and couple empty paint pots and mix them together for a large batch of your own special blend. Odd musing here, but I'm thinking Battlefield Brown mixed with Thornwood Green and a dab of Umbral Umber could really rock the house and get damned close to your Charadon Granite. Jake: If German Field Grey is close enough, I may just go with that. I'm trying my best not to get into mixing colors but instead looking for something I can use straight out of the pot. have you tried GW's Skavenblight Dinge? Seems to be in the same category, a dark grey-brown-thing. I think I'm gonna use it for similar applications as you used the old Charadon Granite, so it might work for you too. TheInvisibleJohnny: I first saw that color and online it looked like a perfect match. Then I saw it real life and it was way too cool of a color like a grey for my tastes. Ron, were you able to find a decent replacement to Charadon Granite? ive been out of the hobby for a couple years, just getting back into it, and was using charadon granite as the base for my space marines and bought stormvermin fur to be the highlight. NOW IM STUCK! From color images, the Vallejo German Field Greay (#70830) that Faolan mentions looks to be a good alternative. Sidi: Not yet. It's a tough color to match. I've actually removed it from my painting at this point rather than fight with it. Sorry. man thats tough to hear. do you reccomend a brown green tone from the new GW range? or from any other range? im a beginner painter. I am doing a Dark Angels DIY, but I didnt want to do a green or black or bone base color. its played out in terms of Dark Angels. I am using Knarloc Green (Loren Forest) as the base color of the robes for the veterans, and was using Charadon Granite for the base color with Stormvermin Fur as the highlight. So any tips and advice/help would be GREATLY appreciated. Ron, have you tried the citadel color "Dryad Bark"? Sidi: It's no problem. I wish I could help more, but my only investigation has been limited to what I've posted here. It's frustrating I know. so i bought some colors today. i bought dryad bark (GW), a medium grey like color from Reaper called Cloudy Grey which is a close equivalent to codex grey and mixed them. pretty close color. id say 90%. i also bought a color called "raw umber" which is your basic run of the mill raw umber from a company called Goldren Fluids which is sold at Michaels craftstores if your in the USA. I mixed raw umber with the cloudy grey and also got good results. 1 part cloudy grey (Reaper Master) Or any medium toned grey such as codex grey/dawnstone grey. just skaven and storm doesnt offer the right color for some reason. it has a more i dunno how to describe it, a grey thats too dark. but mixing a med. grey into the mix must break up the colors in a way. it really is 99% accurate.